I am hesitant to call this my official first quilt because I have actually made three now, but I feel that this is my first one. I started it in Bobbi's class for the Spring project and finished it (with the exception of the binding) before I started the other quilts. 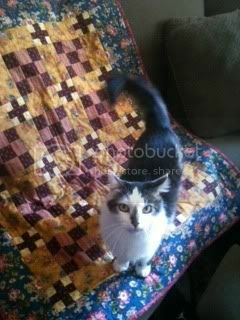 This is the quilt where I made mistakes and learned basic techniques which will help me when I make others in the future. It all started earlier this year at Quiltin Cousins when I saw some beautiful Civil War reproduction fabric, but didn't buy any because I didn't know what to make. The next day I saw online that there was a quilting class that started Monday, the next day. I joined the class and learned that the project would be a Civil War pattern. It was meant to be, I knew immediately that I had to go back and get that fabric! Here is the finished product... and Luke's foot! There are many mistakes throughout (pieces sewn/cut the wrong size, pieces not lining up perfectly, far from perfect quilting, etc. ), but overall I am really pleased with how it turned out. Hopefully my Grandma Rosie will be too since I am giving it to her in a few weeks. The back is made from scraps I had left over. 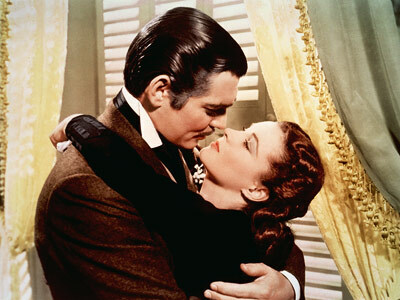 While making the quilt I kept wondering if it was something Scarlett O' Hara may have used. 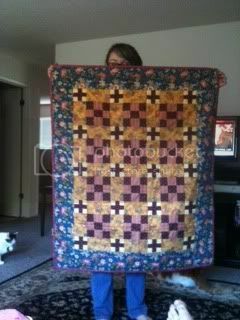 Congratulations on finishing your quilt! 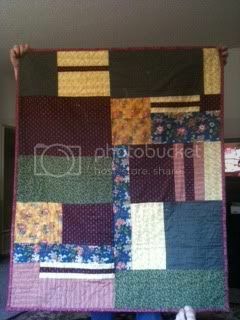 You've given me inspiration to start quilting again. . .I need to stop reading blogs and start sewing. Wow, I'm impressed. I'm sure Grandma will love it! Thank you all for the kind words!! That is so amazing! 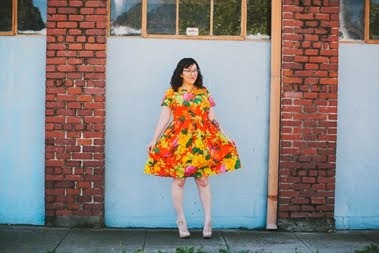 I love seeing you embrace your new hobbies of sewing and quilting! I only wish I were half as patient and creative!